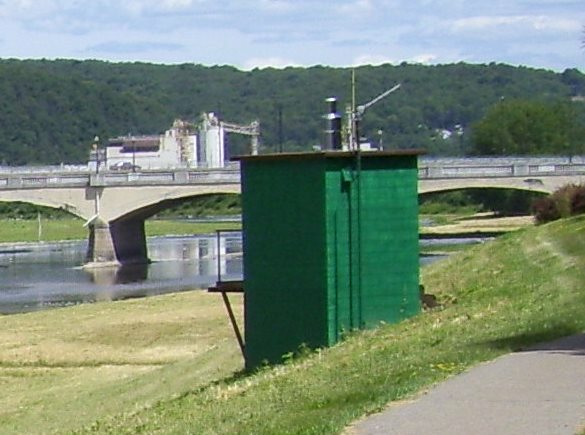 LOCATION.--Lat 42°08'47", long 77°03'27" referenced to North American Datum of 1983, Steuben County, NY, Hydrologic Unit 02050105, on right bank adjacent to Corning Glass Works power plant, 500 ft downstream from Bridge Street, 1.7 mi downstream from Cohocton River, at Corning. PERIOD OF RECORD.--Occasional discharge measurements, water years 1918, 1946, 1968-69. October 1974 to current year. REVISIONS HISTORY.--WDR NY-78-1: 1976, 1977 (m). WDR NY-83-3: 1982 (M). GAGE.--Water-stage recorder. Datum of gage is 900.00 ft above NGVD of 1929 and 899.46 ft above NAVD of 1988. EXTREMES FOR PERIOD OF RECORD.--Maximum discharge, since construction of Tioga, Hammond and Cowanesque Lakes in 1979, about 61,000 ft³/s, Jan. 19, 1996, gage height, 25.93 ft, partially obstructed intake; minimum discharge, 95 ft³/s, Sept. 9, 10, 23, 24, 1991, gage height, 14.30 ft.
EXTREMES OUTSIDE PERIOD OF RECORD.--Flood of June 23, 1972, reached a stage of 40.71 ft, from floodmark, discharge, 228,000 ft³/s, from peak flows determined at upstream and downstream stations adjusted for drainage area and channel storage. EXTREMES FOR PERIOD PRIOR TO REGULATION.--Maximum discharge, prior to construction of Tioga, Hammond and Cowanesque Lakes in 1979, 127,000 ft³/s, Sept. 26, 1975, gage height, 32.46 ft; minimum discharge, 210 ft³/s, Aug. 29, 1978.